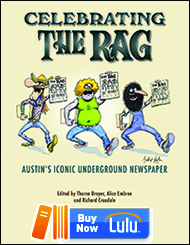 Paul Buhle, the noted historian, author, graphic novel publisher, and editor of Radical Jesus, is Thorne Dreyer‘s guest on the 200th edition of Rag Radio, Friday, December 20, from 2-3 p.m. (CST). 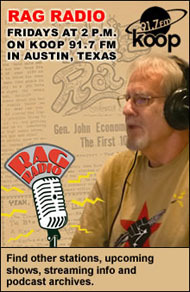 Rag Radio airs and streams live on cooperatively-run KOOP 91.7-FM in Austin, Texas, and is rebroadcast and streamed on WFTE-FM in Mt. Cobb and Scranton, PA, Sunday at 10 a.m. (EST) and on KPFT’s HD-3 Channel in Houston, Wednesday at 3 p.m. (CST). 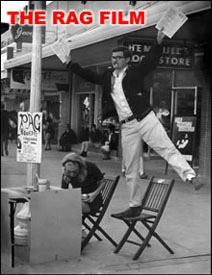 The podcast of this show can be found at the Internet Archive. Paul Buhle is one of the most prolific and insightful critics from the American left. While his topics at first glance appear incredibly eclectic, closer reading uncovers a sharp focus that thoughtfully challenges class disparity, racism, and imperialism in the United States and throughout the world. The breadth of his work, even if you consider only his collaborative graphic titles, is mind-boggling as the topics include Che, Yiddishkeit, SDS, the Wobblies, Emma Goldman, FDR, the Beats, and Isadora Duncan. 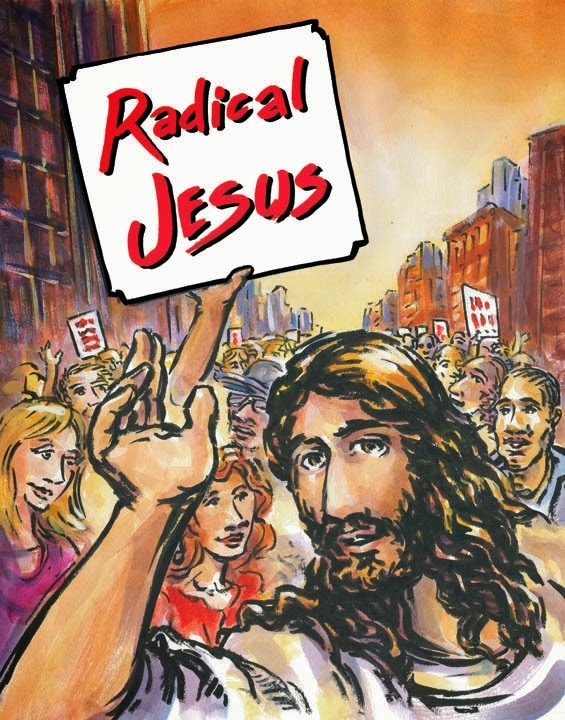 And now, in collaboration with artists Sabrina Jones, Gary Dumm, and Nick Thorkelson, comes Radical Jesus: A Graphic History of Faith. Combining substance and style, the drawings and text constantly switch between social issues of the past and the present. Interviewed by a reporter for the Brown University newspaper, Buhle said that he wrote the book for the young people involved in the Occupy Movement. Oh, let’s say I was speaking to those young people. I’m not a person who goes to church. But I was speaking to those young people and to others who were looking for some alternative, there’s one page in the comic that says no to either passivity or violence. For some other way to respond to the crises, and you know, Americans by and large, still, have this religious thing, this mystique. It’s good to think of a way to speak to them in this fashion. There are numerous poignant frames in Radical Jesus; below are some samples. With stark black and white graphics page 23 in the “Radical Gospel” section, by Sabrina Jones, begins with a priest looking at a dead man lying in the street, “unclean — better keep away!” Another priest does the same but then comes the Good Samaritan who helps the man who isn’t dead — who is the Christian. This God did not just talk… He showed himself to be a doing God. Perhaps we might add another point about God — he takes sides. He is not a neutral God. He took the side of the slaves, the oppressed, the victims. He is still the same even today; he sides with the poor, the hungry, the oppressed, and the victims of injustice. Some martyrs were burned at the stake, others were drowned, decapitated, had their tongues ripped out, or their mouths filled with gunpowder. To go to a violent death with cold determination or even good cheer was to prove to all present that the believer placed ultimate trust in God’s judgment. However, these executions were ultimately cynical and class disparately vicious. French and Belgian royal courts sometimes offered ‘banquets’ for the intended victim the day before the execution. In the city hall, the accused would be compelled to take the seat of honor between the mayor and a local religious leader while being mocked and offered expensive food and wine. Many a martyr refused to eat or drink! The last pages of “Radical History” speak to the Quakers in Pennsylvania losing the fight for Indian rights. Two frames appear on page 85 with the first showing Quaker representatives in the Pennsylvania Assembly resigning and walking out of the chambers in protest of oppressive actions to attack Indians. The second frame, titled “What was Lost,” depicts people in a living room watching a baseball game between the Philadelphia Quakers and New York Iroquois — shades of Howard Zinn history. The 39 pages of the book’s last section, “Radical Resistance,” is thick as the art of Nick Thorkelson and the text speak to the many more modern quests for social justice through questions/statements of a grand diversity of people on-the-ground testifying at a faith-based meeting. The courage of abolitionist Sojourner Truth is portrayed in a story called “Steal Away: Abolitionism and Black Freedom.” We meet those who fought for civil rights in the United States like Rosa Parks, Ella Baker, Martin Luther King, Ralph Abernathy, Fred Shuttleworth, Bob Moses, and many people whose names we don’t know. “Radical Resistance” also tell us of Dorothy Day and Peter Maurin’s Catholic Worker movement as a lead into the anti-war actions of the Berrigan brothers — liberation theology and the work and political assassination in El Salvador of Archbishop Oscsar Romero. 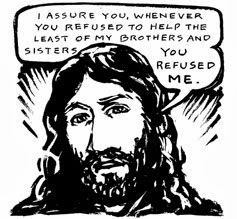 All of these accounts of activism conclude with stories of people that we have never heard of who fight for social justice in both their communities and throughout the world — and there lies the “mission” of Paul Buhle and his collaborators in Radical Jesus. The radicalism of Jesus has nothing to do with men hoarding guns against the imagined threat of black helicopters, or bearded fanatics burning down schools for women. Instead, Jesus goes to the roots of assorted hatreds — not only our destructive exploitation of humanity but also our plundering of creation. All of life is endangered and we cannot afford these hatreds running rampant much longer. Radical Jesus provides the stories of models, teachers, for the young people for whom Buhle says the book was written. The book’s portraits, graphics, and text are thoughtful and powerful, and are important not only for young activists, but also for all of us who thoughtfully work for social justice. This entry was posted in RagBlog and tagged Alan Wieder, Biblical History, Books, Comics, Graphic History, Graphic Novels, Jesus Christ, Liberation Theology, Paul Buhle, Radical Gospel, Radical Jesus, Rag Bloggers, Religion, Social Justice. Bookmark the permalink.